Ride to the Swedish wilderness! Are you ready to get a unique experience full of unknown sensation that an extended period of time with the dogs will provide you. Our siberian huskies are waiting for 1 and only thing...Winter. Indeed they rest and train during summer and autumn so to be able to get fit for the winter season because they know that they are going to run the tracks over and over again and they just love it. The morning before departure you are going to hear them for sure, they are going to shout and be all over the place but as soon as the musher will lift up the anker, the silence will fall and the only noise you’ll be hearing will be the crushing of the snow under each paw steps of your dogs. Feel the sensation of the departure, the power that the pack is finally able to unleash will provide you this wider smile ever on your face, this very moment is simply unforgetable. Explore the region. Here no one else is passing by except maybe a local on an unknown mission. This is pure wilderness, your only company is your groupe and of course your dogs. 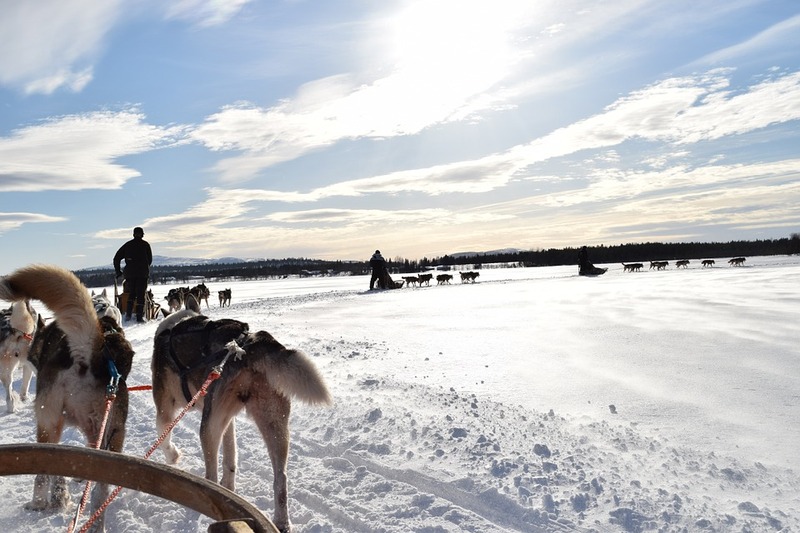 Go for a 4,5 hours dog sledding ride. More than enough to get some great sensation and a good clue of how to handle your pack. Learn how to handle your dog team and enjoy your day on their company in a wilderness atmosphere. There starts this so expected 2 day adventure throughout hills and forests accompanies by your dogs. After a long day out in the wilderness you’ll be staying in our wilderness camp. There no power and no running water but all the needed confort and a true experience of pure and silent nature. No road to disturb your silent moment, only the sound of the snowflakes and no light shading the pastel colors of the northern lights of the night. Enjoy your evening in our traditional sauna especially prepared for you. Your guide will serve you a typical northern dish that you’ll enjoy under the candle lighted restaurant of our wilderness camp. Time to get back to civilisation and catch your flight to return home the head full of memories.